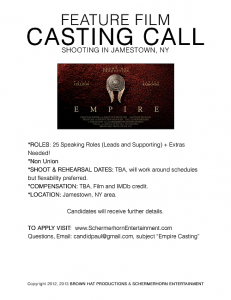 Browse: Home » Empire Casting Call! 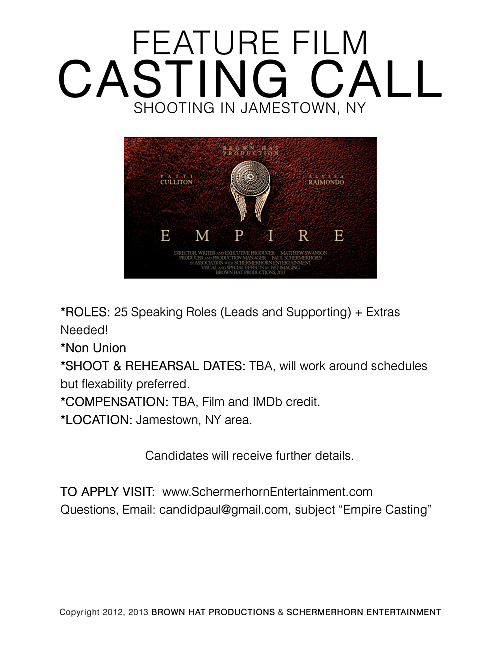 Brown Hat Productions and Schermerhorn Entertainment are calling for local talent for a feature film titled Empire. Starting now and going through the end of March of 2013, we are looking for a wide range of people. Story Synopsis: RIVER CARRINGTON, a recent college graduate in search of a job, is interviewed by Entrepreneur SARAH HINDLE for the position of a historical investigator. Sarah’s company is responsible for financing archaeological digs around the world. With Sarah’s resources, River uncovers the truth behind a lost legendary cavern and the disappearance of an entire Native American tribe. To audition, we’d like everyone to download the script excerpt provided HERE, film themselves reading for either Jesse or River, depending upon your gender, and upload the video privately to YouTube. Nothing too complicated. Then fill out the form HERE and include the YouTube unlisted link. If you are unable to film yourself, fill out the form and come to the open casting call being held at The Spire Theater on March 28th at 5 to 8 PM. For more information about the film as it becomes available, ‘Like’ the film’s Facebook page HERE.